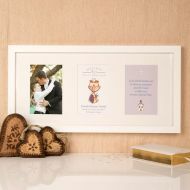 Original illustrated First Holy Communion designs in a triple mount premium frame. Personalised Occasion Details are printed onto high gsm premium paper. Recipient adds personal photo to complete this premium quality gift.